Yet another one from Android. 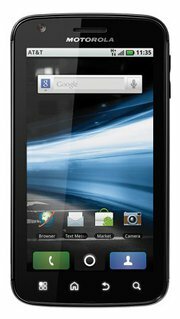 America’s leading mobile phone carrier AT&T is all spiced up for the launch of a new smartphone, namely the Motorola ATRIX 4G, whereas the handset is also expected to arrive at various other retail outlets too. Marking the official launch of the Android powered smartphone over the carrier, customers would be delighted to purchase the handset at a much lower price than expected. AT&T is expected to make the device available for purchase by February end, with a price tag of $199.99 upon signing a two-year contract agreement with the carrier. Whereas RadioShack is offering the powerful smartphone at a much better price, users should not that the handset requires a $15 per month or higher data plan, in addition to the voice plan.